Home › News › IX International Festival of Chamber Music "Foundation Monteleone"
The Palacio del Conde Luna Leon, He hosted the presentation of IX International Festival of Chamber Music, organized by the foundation Monteleone. 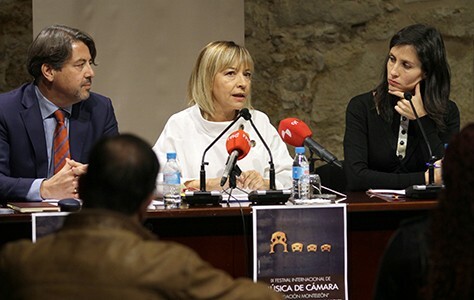 The event was attended by Carmen in May, artistic director of the festival, Fernando García Llamas, Monteleón manager of the Foundation and Eva Sandoval, musicologist and music journalist of Radio Nacional of Spain (RNE). The ninth edition of the International Festival of Chamber Music "Foundation Monteleone", that since 2010 bet for the best chamber music repertoire and the promotion of young formations, It is held from 5 al 9 December in the Auditorium "Ciudad de León". Legendary Trio di Parma, formed by pianist Alberto Miodini, violinist and cellist Ivan Rabaglia Enrico Bronzi, will inaugurate a new edition of the festival leonés, which it has already established itself as a benchmark of national and international chamber music scene. The well-known Italian side, founded in 1990 at the Conservatory "Arrigo Boito" of Parma, performing works by Liszt, Schumann y Brahms, the long list of internationally renowned guest artists adds, as the duo formed by violinist Daniel Rowland and pianist Natacha Kudritskaya, Apollon Musagète, Doric String Quartet, Quatuor Ebène or el Quartetto di Cremona, among others, who have gone through the festival in previous years. Besides the guest group, It is serving as a "model of artistic achievement and reference for young talent", we can enjoy the interpretive excellence of young talent from around the world, They are arriving in León, after being selected by the festival jury. Carmen in May, Festival artistic director and professor of Chamber Music at the Conservatory of Music in Valencia, highlighted "the growing number of proposals coming from all over the world, which rises this year 78, and the high level of the performers that have arisen from Europe, Asia and Latin, which every year becomes more difficult the selection of the four participating formations ". Youth groups who will perform at this year's Festival will be Monteleón: String Quartet Jubilee UK; German clarinet and piano duo formed by brothers Bettina and Robert Aust; the duo formed by Swiss cellist Christoph Croisé and pianist Oxana Shevchenko Russian and French Trio sora, composed by pianist Pauline Chenais, violinist Magdalena Geka, and cellist Angèle Legasa.